A new cultural and entertainment center just opened in Jerusalem and it's called the "First Station." With a farmers' market, restaurants, crafts stores and a children's play center, the First Station promises to be a busy hub for Jerusalem activity. 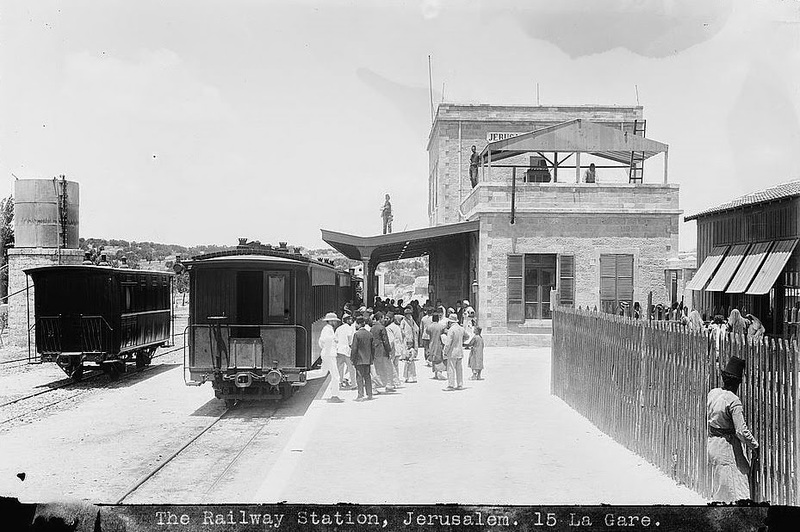 Just like it was when it first opened in 1892, more than 120 years ago, when the first train from Jaffa pulled into Jerusalem's new train station. Open seven days a week, the new attraction presents a different fair every day. View the First Station's website here. 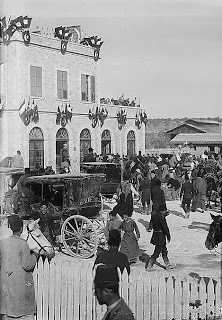 The Jerusalem train station has been a frequent feature of the Israel Daily Picture, with pictures of the arrival of the German emperor in 1898 and the transfer of a high-ranking British prisoner of war, Col. Coventry in 1916, captured in Sinai during World War I. 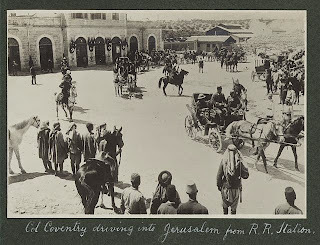 The mystery picture above of a dignitary's arrival is dated by the Library of Congress as between 1898 and 1946, the years the American Colony photographers were active in Palestine. But numerous clues helps to pin down the dates. Why is an antelope among the soldiers? The railroad to Jerusalem was halted during World War I and not reopened until October 1920, so the arrival ceremony with a British honor guard could not have taken place before that date. Posters on the station wall advertise the White Star Cruise Line that ceased operation in 1936 when it was taken over by the Cunard Line. We can date the picture between 1920 and 1936. There's also one more curious feature seen when the photo is enlarged. 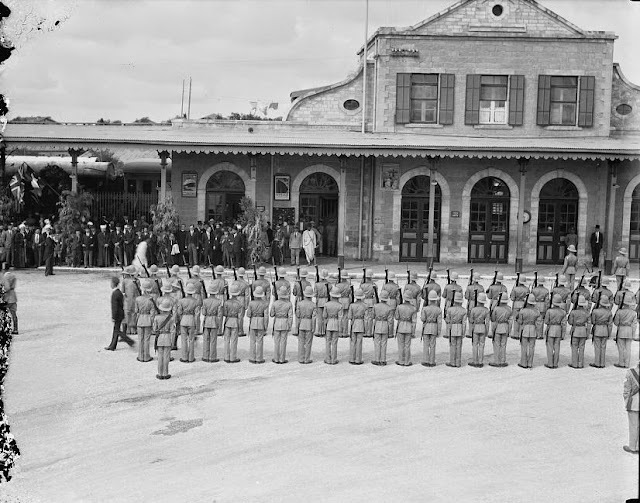 Among the rifles and bayonets on the right of the photo appear two animal horns sticking up. The decorated horns belong to "Bobby," an antelope, the regimental mascot of the Royal Regiment of Fusiliers. 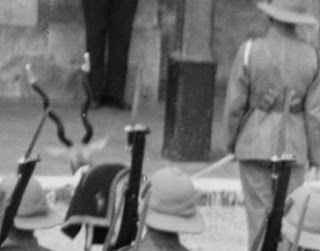 According to the Fusiliers Association of Great Britain, "The mascot was looked after by two handlers chosen from the battalion, they would make sure that he was fed and watered and exercised. When on parade they kept him under control by means of two white ropes attached to his collar which was also white, and was emblazoned with a large silver badge. On his back he wore a coat of royal blue, embroidered with the regimental crest, and his horns were tipped with silver cones." 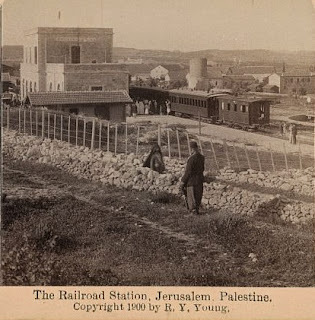 The railway line to Jerusalem was not closed at all during WW1, even while it was converted to standard gauge in 1918. 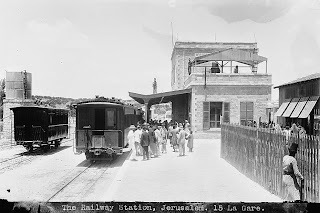 If you would have approached the Israel Railway Museum with your query, I could have referred you to photo no. 10464 in the same Matson Collection, which is of the same event and clearly shows Feisal the 1st of Iraq on his arrival in Jerusalem. It is NOT of the arrival of Sir Wauchope as suggested by Mr. Bessin, as this event is covered by pictures 08397, 13578-9, 13582-13583 and 15757 and is visually very different.